Ear Candy: What Makes Great Sound? And Why Does It Matter Most? Frank Foti, founder of Omnia, has a new blog series! 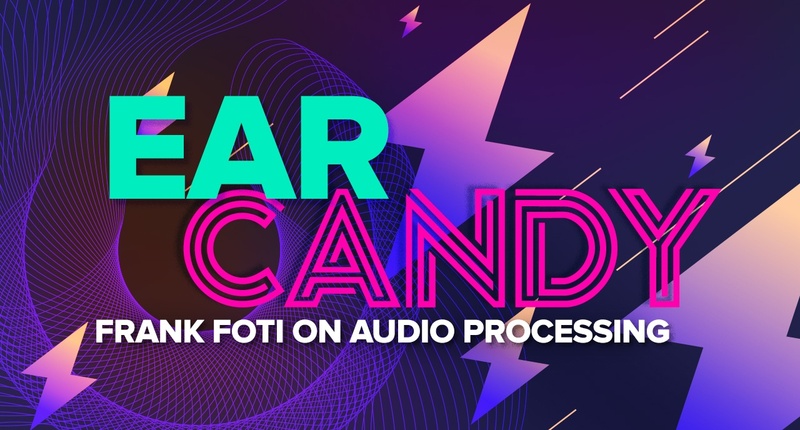 This six-part series will cover everything you ever wanted to know about broadcast audio processing from the man who practically invented the category. This month we are kicking it off with Frank's views on great sound, and why it matters more than anything else when it comes to audio attracting and retaining listeners...longer. Transmission audio processing is both an engineering and artistic discipline. The engineering goal is to make most efficient use of the signal-to-noise ratio and audio bandwidth available from the transmission channel while preventing its overmodulation. The artistic goal is set by the organization using audio processing. It may be to avoid audibly modifying the original program material at all. Or it may be to create a distinct sonic signature for the broadcast by radically changing the sound of the original. Most broadcasters operate somewhere in between these two extremes. Provided that the transmitted signal meets regulatory requirements for modulation control and RF bandwidth, there is no well-defined right or wrong way to process audio. Like most areas requiring subjective, artistic judgement, processing is highly controversial and likely to provoke exceedingly opinionated arguments between its practitioners. Ultimately, the success of a broadcast's audio processing must be judged by its results—if the broadcast gets the desired audience, then the processing must be deemed satisfactory regardless of the opinions of audiophiles, purists, or others who consider processing an unnecessary evil. One mark of the professionalism of a broadcast engineer is their mastery of the techniques of audio processing. The canny practitioner has a bag of tricks that can be used to achieve the processing goal specified by the station's management, whether it is purist or "squashed against the wall." The are many schools of thought as to how one achieves their end result. This topic has been, and probably will be debated ad nauseum until the cows come home! That said, there really are aspects regarding what it takes to create great sound, and why it matters most. Before any consideration is given to tweaking the processing, trying out, or installing a new processor, the first agenda item must be, what is the desired goal with respect to on-air presentation? Next, and equally important is, who or whom will be the deciding factor in the process? If the answer is “a committee,” then stop right now, as experience has rarely yielded a successful result, or consensus among the group. It is best to have a single person be the decision-maker here. For those with experience, over time, it may be the Program Director, Station Manager, and sometimes it will fall onto an engineering director. But, knowing there is a point person, ensures a smoother process and quicker end result. The health of the facility plays a very critical part in all of this. In addition to good engineering practice, it is paramount that every aspect—from studio microphone right up through to the antenna—operates in tip-top shape. Even facilities that are 100% digital must make sure there are no Achilles heels within the infrastructure. By example, sample-rate converters are known sources that will affect peak level overshoots in the transmission path. Likewise, content that may exist in a coded audio format, can degrade sonic performance, once processed over-the-air. Likewise, facilities which may be a mix of analog and digital can pose a few challenges, such as the number of analog-to-digital and digital-to-analog conversions that take place. Also, using products that employ less than top-quality converters will degrade sonic performance. The list of items, and variables, to consider within the broadcast plant is worthy of its own discussion. Thus, it’s imperative the broadcaster is working with capable personnel to know the difference and ensure the facility is operating in peak form. Regarding great sound, as mentioned prior, it begins with a good plan and facility. Then, it requires the best tools to deliver the desired end result. The obvious key tool here is the audio processor, or system itself. Likewise, it’s 100% vital and critical to have someone who fully understands the goals…AS WELL AS…possesses the knowledge and ability to adjust and modify the processing. This is especially valid when testing or installing a new product. If there are questions about how to obtain a certain signature or operating function and the answer keeps alluding those involved, it is best to contact the manufacturer for assistance. Up to this point, much or all of this may appear simplistic—and to most it is. But you would be surprised how many times the obvious gets overlooked in one way or another, and ‘issues’ ensue. With respect to the processing itself, the pendulum swings between being ‘squashed,’ ‘clean,’ or somewhere in between! Creating a ‘squashed’ persona is quite simple. As my radio programming guru buddy, Steve “Studs” Kingston would say, "Crank It Up, Man!" Basically, that’s it. Jam on the dynamics and clipping sections until your ears bleed! Personally, I wouldn’t categorize that as great sound, but if that’s the desired goal, then who am I to argue? For those who desire what I’d refer to as “competitive quality,” which possesses both clarity (quality) and competitiveness (loudness), the tools exist to achieve this result. We, our processing developers, have invested significant amounts of time into processing algorithms that yield high degrees of clarity AND possess like amounts of competitiveness. Basically, you can have your cake, and eat it all too! This is accomplished through innovative methods applied to the dynamic processing sections (compressors and limiters) and the critical absolute peak limiter (clipper). We have developed methods that will eliminate the sonic annoyances associated with competitors’ products or older processing systems. We have found through application of these newer processing methods, broadcast stations are able to maintain strong ratings which yield both high CUME and TSL results. This is the key to great sound and why it matters most. Processing for effect is always possible, and there are many ways to accomplish that. Personally, I’ve always subscribed to the ‘dynamically loud’ profile, which is the allusion of being perceptibly louder. Thirty-five years ago (1983), when crafting the processing for Z-100 (WHTZ-FM) NYC (pic of yours truly and Scott Shannon back in the Z-100 days, right), we were in a neck-n-neck loudness war with WPLJ. Electrically, 'PLJ was probably louder, but Z-100 was perceptibly louder based on the processing and how it was tuned. There was enough dynamics retained in the audio, where the ear was able to ‘breath’ a bit. On account of that, it appeared louder compared to the heavily dense competitive signal where the ear had no chance to ‘breath’. The analogy is what happens when you stick your finger under hot water. If you poke your finger in and out of the hot stream, it feels hot every time. This would be dynamically breathing of the nerves in your finger. But if you put your finger under the hot water and leave it there, it will feel hot for a moment and then adjust to the temperature as the nerves desensitize. The same happens with the ears. Dense audio will desensitize the nerves in the ear canal and it will not sound as loud anymore. Yet electronically the signal may in fact be louder based on RMS level. This is what causes listener fatigue. Also, processing for dynamic loudness supports TSL, as it is much less fatiguing to listen to. Today, audio processing is capable of delivering a strong sonic impact, yet retain high levels of clarity, quality, and musicality. By example, WCRB-FM in Boston is one of the nation’s most well-known Classical and Fine Arts radio stations. For their format their ratings are very successful, yet their processing enables them to be competitive in the Boston market with all of the contemporary format stations. This is accomplished using the processing methods described earlier. Here is a great example where it is possible to listen for long periods of time, yet the sonic signature has enough impact to stand out on the dial while the audio remains crystal clear. And this is with classical music. Sort of like the Boston Pops taking on THE WHO!